Join Ghawazi Caravan at the Steiner School Fair Day! Date: Saturday 30th March 2019. Devi teaches and performs in Brazil! Date: 25th April to 1st May 2019. Ghawazi Caravan perform at Ironfest! Ghawazi Caravan perform at Winter Magic Festival 2019! Date: Saturday 22nd June 2019. Watch Ghawazi Caravan and other special guests and teachers perform at the gala concert as well as at the market day with Ghaziya and students of the festival! Devi teaches and performs in Tasmania! Devi teaches and performs at Sacred Circles, U.S.A! Devi teaches and performs in South Carolina, U.S.A! Devi and Deb Rubin teach and perform in L.A, U.S.A! 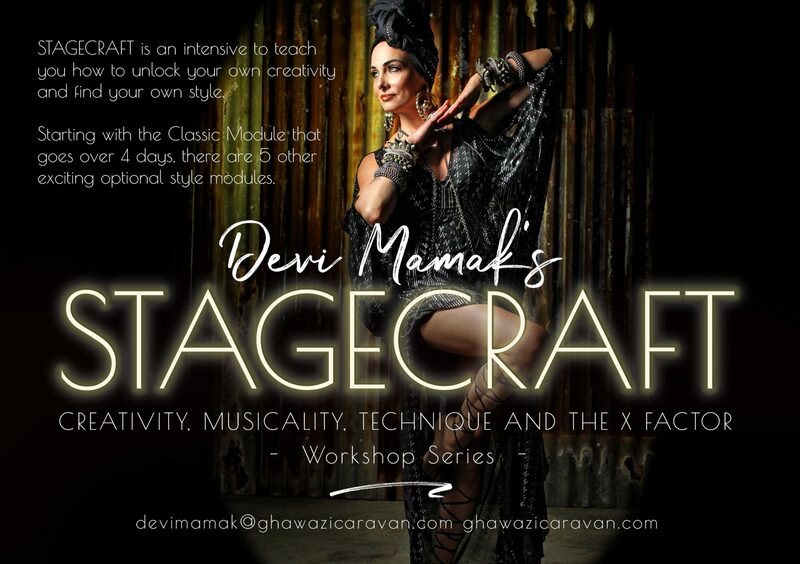 Devi teaches and performs in Melbourne! Devi teachs and performs in Brazil! STAGECRAFT – The science of successful performance. In this brand new intensive Devi will guide you through step by step on how to become the best dancer you can be! This intensive will include how to get the most out of every movement, the importance of stillness, foot and arm patterns and how to keep track of them, musicality including various ways to break down some of the most challenging time signatures so you will have the confidence to use them, fun and new ways to use your zills, improvisation, how to choreograph and more! Devi’s intention with this new intensive is for every dancer at every level, whether they are a performer or not to be able to unlock the door on some of the more challenging aspects of being a dancer and change the way we think when coming up against some of these issues. As well as a brand new outlook on your dance Devi wants you to find your own unique style and she will help you to bring that out into your dance whether it be in the comfort of your own home, the classroom or on the stage. Technique: 3 hours (10am – 1pm). In this workshop Devi will show you her method for beautiful arms and hands, hips, torso work and layering. The focus for this workshop will be on getting the most out of your movement, working from your centre and dancing from the inside out rather than focusing on technique from a specific style. In this workshop Devi will share with you a step by step process of the classic foot and arm patterns which you can mix and match to create your own movement. We will also look at the importance of weight shift, resistance and release, movement and stillness to give your dance interest and dynamics. Devi is well known for her exciting stage dynamics and formations. In this workshop Devi will present her method for staging, formations, and shapes within those formations. We will also look at the best formations and shapes for both small and larger groups. In this workshop you will learn how to get the most out of your staging and movement. This will include spins and turns, travelling, directional changes and levels . Devi will also share with you creative ways to create your own longer combos, using the knowledge you already have in your body that you can work into your improvisation or choreography. ATS (r) 4 day intensive with Devi ! Join Devi for the ATS (r) module of STAGECRAFT. We will start the intensive by taking a look at the science of ATS(r). How does ATS(r) work and what is behind that ATS(r) look. We will then put this knowledge into practise by drilling this with some of the Classic ATS(r) steps. The last 2 days will be on how to utilise props with group improvisational choreography. We will take a look at how to modify some of your favourite ATS(r) steps with a sword, short fanveils, skirt and basket. NOTE: The ATS(r) style module of STAGECRAFT follows on from the first 4 days of STAGECRAFT, the Classic module. It is not necessary for you to complete the Classic module first but if you would like to be involved in the Classic module I will be teaching the first 2 days of the Classic module in Maitland on 18th/19th May and the last 2 days of the Classic module in Maitland on 24th/25th August. Message me for more info on the Classic module in Maitland. ATS(r) MOVEMENT DIALECT MODULE AND ATS(r) WITH PROPS. The Science of ATS(r). 2 hours. by demystifying the ATS(r) posture and bodyline. Devi will give you the tools to apply this science to your ATS(r) body. We will then put this into practise by pulling apart and drilling some ATS(r) classic and modern steps with an attention to detail for a strong foundation. Shoulder shimmy pass and trio. Back walk Egyptian facing in and passing. Flamenco triangle fade and circle. Advanced movement dialect & partnering combos by Ghawazi Caravan & friends. Triple Egyptian duelling duet box. Side fades with Arabic, Egyptian basic and triangle step. Arabic flair pass with 2. Choose wisely. Strictly NO REFUNDS! Devi teachs and performs at Sacred Circles, U.S.A! Devi teachs and performs in South Carolina, U.S.A! Devi teachs and performs in Melbourne!